Scandinavian landscape architect, Jens Jensen worked in and around the midwest in the late nineteenth and early twentieth century. In 1909, he was asked by the Preus administration to landscape Luther’s evolving campus. This semester, the six students enrolled in Art in the Nineteenth Century were given the task of creating an exhibit focusing on Jens Jensen’s ideals as manifested in Luther College campus and landscapes pulled from the Fine Art Collection. We used resources such as Jensen’s own writings, Luther’s Fine Arts Collection Archives, and the future campus development plans in order to illustrate the holism of the ideals held by this landscape architect and Luther College. Jensen was ahead of his time in thinking about the living and learning environment, both in physical planning and sustainability. His values are shown throughout campus, especially in such elements as the council rings scattered about and the curving of the sidewalks that connect campus buildings. 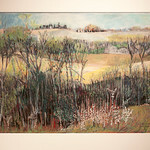 As former professors, alumni, and Decorah residents, each of the artists featured in our exhibition knew this landscape intimately. 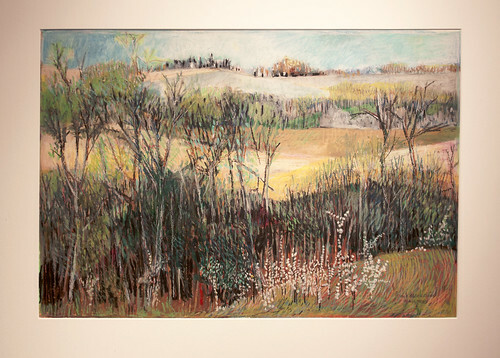 Although none would likely cite Jensen as a direct source of inspiration for his or her work, each illustrates an important aspect of Jensen’s philosophy that one grows to appreciate intuitively as one walks the Luther College campus.